Home Family Humor Posts LOL Parenting Parenting Hacks How Well Do You Know 2017 Slang? 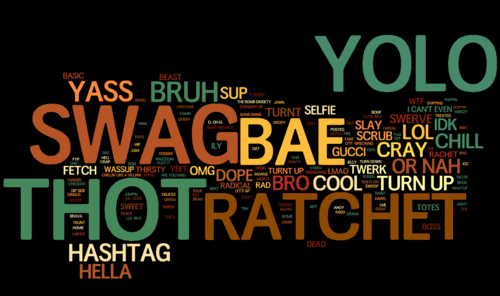 How Well Do You Know 2017 Slang? I recently read a tweet that made me realize, I'm slipping. Hard. I'm out of touch with slang. It's so bad when I did some research on 2017 slang and read, "Snatched" is officially the new "fleek," my inner-awesomeness died a little. Fleek? What the hell is that? And I'm guessing "snatched" has nothing to do with stealing something. So, I did more research. About It- 100% all in. Canceled- Over it. Deleted out of your life. "I canceled our relationship." Boots-if someone adds the word, Boots, to the end of a word or statement, you can thank the viral maniac Todrick Hall. It's meant to drive home the statement. Think" Damn, I'm Tired Boots! Extra- Means you are trying way too hard. Hundo P- I agree one-hundred percent. Hunty- Combo for Honey and C*nt-some use it for their Friends others for foes. It goes both ways. High Key- Real. Straight-Up Truth. Live- describes something that was an Amazing time/party/event. It was Live! OTP- One True Paring. Refers to your favorite couple or a super couple. Ship- Describes two people who should be in a relationSHIP, but are not. They should be Ship. Slay or Slayed- Award winning performance no one can do it better. Think every time Beyonce gets on stage. Stan or Stanning- Obsessed fan. Relates to the Eminem song, Stan, about an obsessed fan. SUH- Think: what's up? Say it like it looks- suuuuuh. Sus- short for Suspect. Internet/text talk for shady, sketchy, watch out for that person. Watch Netflix and Chill- Means, you wanna hook up. Seriously. It's text talk for let's get it on. Woke- describes a caring, thoughtful, sympathetic and/or knowledgeable person. 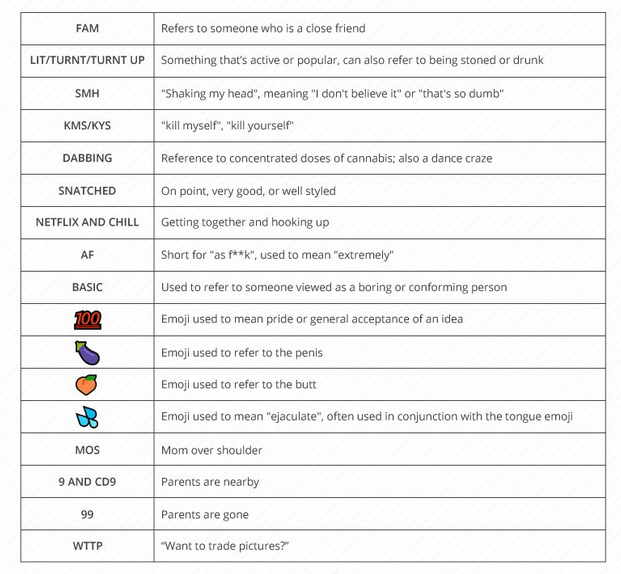 And last, a pinable/printable image for parents to keep on hand to make sure their children are not tweeting/texting/gramming/facebooking/snapping about innapropriate things. Did I miss anything? If so, please add it in the comments!